NetApp® technology enables data centers to extend their virtual infrastructures to include the benefits of advanced storage virtualization. NetApp leads the storage industry with a single information platform that is hardware agnostic, is able to aggregate disparate forms of hardware together, and can virtualize access to that storage—in effect, a storage hypervisor. NetApp clustered Data ONTAP® 8.1 technology is the storage hypervisor: a platform of storage efficiency, VMware integrations, and solutions. 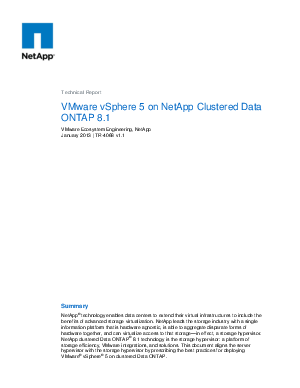 This document aligns the server hypervisor with the storage hypervisor by prescribing the best practices for deploying VMware® vSphere® 5 on clustered Data ONTAP.